With just one step, sixteen-year-old Alexandra Jennings' world changes--literally. Dreading her first day at a new school, Alex is stunned when she walks through a doorway and finds herself stranded in Medora, a fantasy world full of impossibilities. Desperate to return home, she learns that only a man named Professor Marselle can help her... but he's missing. While waiting for him to reappear, Alex attends Akarnae Academy, Medora's boarding school for teenagers with extraordinary gifts. She soon starts to enjoy her bizarre new world and the friends who embrace her as one of their own, but strange things are happening at Akarnae, and Alex can't ignore her fear that something unexpected... something sinister... is looming. An unwilling pawn in a deadly game, Alex's shoulders bear the crushing weight of an entire race's survival. Only she can save the Medorans, but what if doing so prevents her from ever returning home? Will Alex risk her entire world--and maybe even her life--to save Medora? 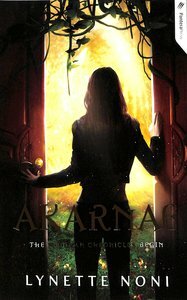 "Akarnae" is a debut Young Adult Fantasy novel that will blow you away! If you are a fan of the Fantasy genre AND a lover of the X-Men, I would HIGHLY recommend this series. It's even appropriate for younger readers making the transition into teen fiction. It's at an amazing price PLUS Lynette Noni is an Australian author so you'll be supporting the #LoveOzYA movement by purchasing this book. This is one of my all-time favourite series and I want you to read it!